THE factory price cutting goes on in the sheep trade with Kildare Chilling and Moyvalley Meats both reducing their official quotes for lamb. In the case of Kildare Chill­ing that’s down 10c/kg to €4.90+10c/kg quality assur­ance, while Moyvalley Meats falls 20c/kg to €4.70/kg. 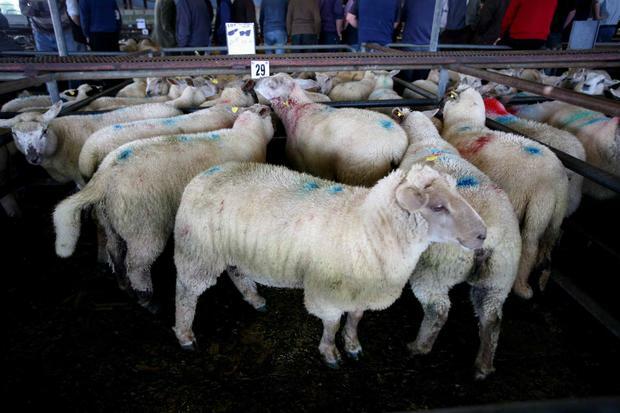 Both ICM plants, Kepak Ath­league and Dawn Ballyhaunis leave their quotes for lamb unchanged from last week, at €4.80 plus bonus of 10c/kg in the case of the two ICMs, that’s €4.90 plus 5c/kg bonus for Kepak and a straight €4.80/kg for Dawn. It’s been downhill all the way since the week of June 13, when official quotes ran from €5.80/kg plus bonuses to €6.00/kg plus bonuses. 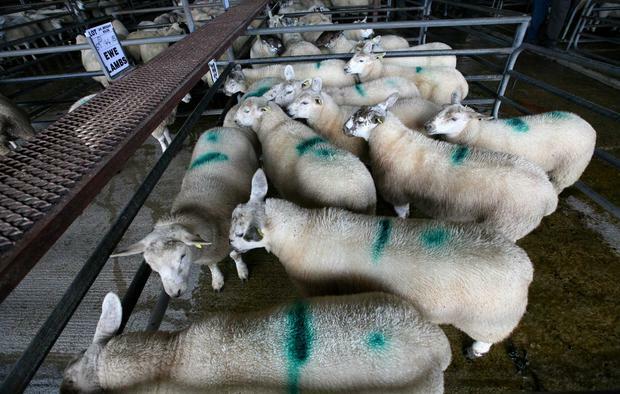 Leaving the 5-10c/kg bonuses out of it and sheep farmers are looking at a minimum price fall of between €1.00-1.20/kg in eight weeks or from €21.50-25.80/hd on a 21.5kg carcase. 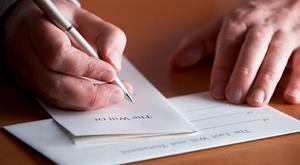 Despite the latest price pull John Brooks of ICSA is opti­mistic that we may be seeing the bottom of the current price cycle. “I’m not saying prices will rise but I can see them staying around the €5.00/kg mark for a while as shipping and the overall Ramadan effect will hold things steady,” he said. To be fair prices last week did not dip below that €5.00/kg mark so we shall see how this plays out. 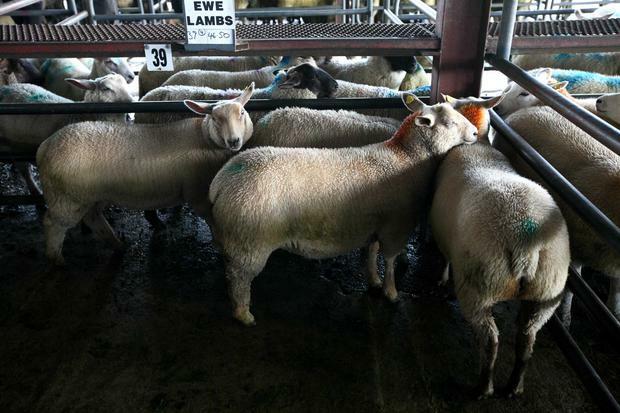 Ewe prices remain un­changed again this week with official quotes continuing to run from €2.65/kg plus 5c/kg bonus at Kepak, to €2.70/kg plus 10c/kg bonus in Kildare, with the two ICM plants both on €2.70/kg. 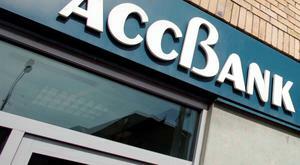 Prices on the ground for cull ewes are reported to be running from €2.80-2.90/kg with some talk of €3.00 possible. Some cull ewes might be held in retention as farmers maintain numbers to comply with the €10/hd ewe scheme. For the present however, the word most commonly used by mart managers is that prices are holding “steady”. 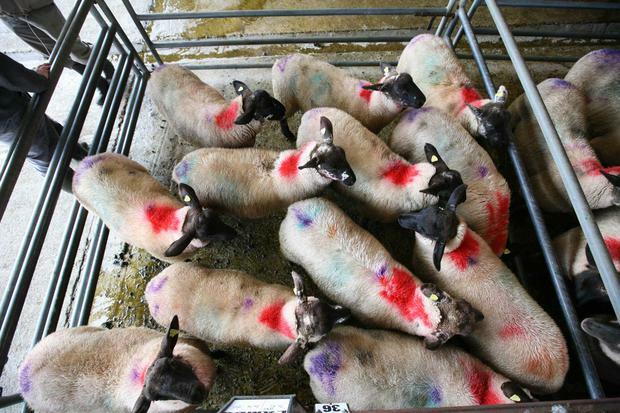 Although as Ivan Moffitt of Manorhamilton said: “It takes a really good lamb to cross the line at €100/hd”. Looking at the broader pic­ture, the Department of Ag­riculture’s census taken last December showed there were 3.92 million sheep in the coun­try — up 4pc from 2015. Although overall flock size was only marginally up on 2015 at 108/hd. 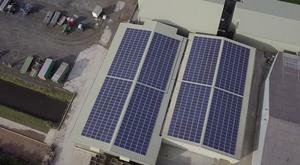 The stand out figure is that 3.92m which puts us within touching distance of the 2005 peak of four million. 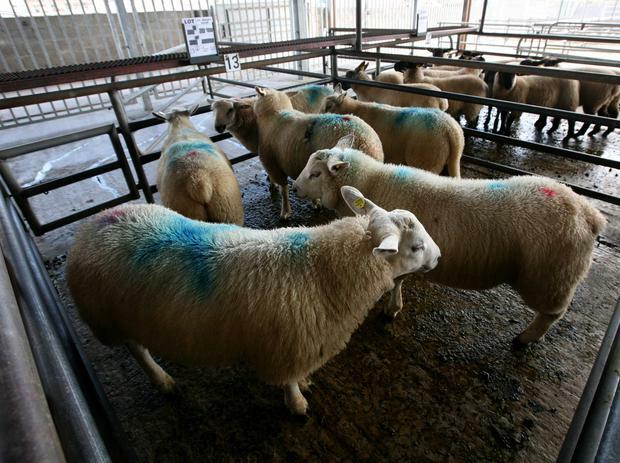 STORE lambs were “broadly” making €2.00/kg said manager Eoin Burke. He considered those of average quality to be back about €5/hd. Mountain stores were reported as harder sold with prices dipping as low as €28/hd but with averages in the €30-35/hd range. 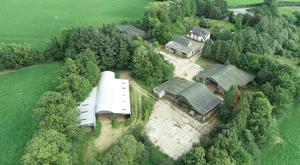 Mountain ewes for breeding sold from €40-60/hd. RECENT factory price pulls have not helped the mart trade for lamb with Ivan Moffitt reckoning that €10/hd has been wiped off the price of factory lamb in the last three weeks. While he had 47-48kg lamb that made €110/hd he said “it takes a really good lamb now to cross the line at €100/hd”. Heavy butcher type sheep made up to €113/hd for 50kg. TRADE was“steady” with factory lamb making from €90-108/hd. Well presented Suffolk ewes lambs went for €85-110/hd. Store wether and ram lambs sold from €70-85/hd with lighter mountain types making €45-70/hd. Heavy cull ewes made from €80-110/hd with store ewes selling at €40-70/hd. Hoggets hit a top of €170/hd off a €140/hd base with lighter pens making from €100-140/hd. SPRING lamb prices averaged €85/hd with the top of the market seeing €124/hd stags averaged €73/hd to a top of €120/hd. Hogget prices averaged €108/hd with the top of the breeders fetching €162/hd while among the breeding ewes prices averaged €147/hd with the top price being €165/hd. 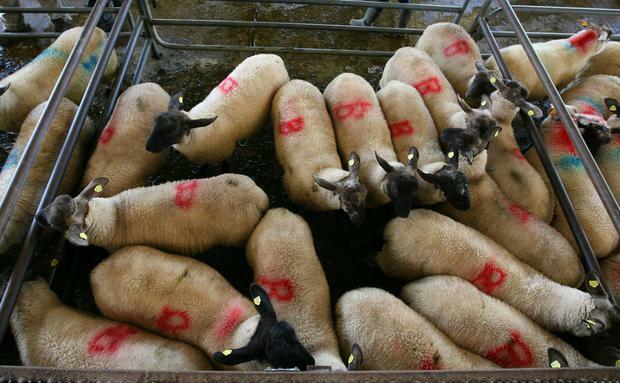 Ewes with lambs at foot made €140/hd. 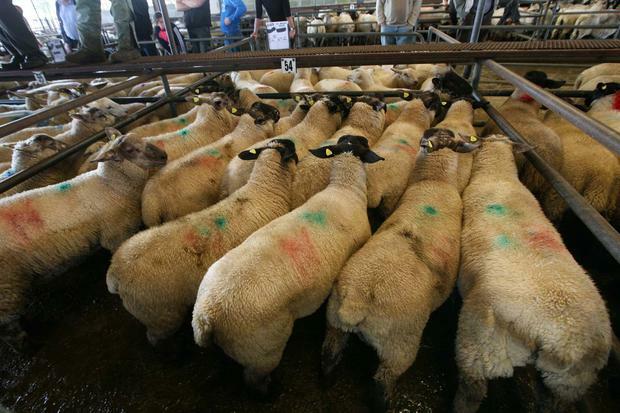 WITH over 2,000 sheep on offer trade was steady with store trade prices up €2-3/hd. Forward 40kg+ stores sold from €86-97/hd while among the 35-40kg section prices ran in general from €78-85/hd but with some €90/hd also about. Trade for the 28-32kg type was described as “very active” with ram lambs selling for €65-66/hd with nice ewe and wether types making up to €74/hd. “SHEEP are a good trade” said auctioneer Jim Bush of yesterday’s sale with butcher type lambs ranging from €108-117/hd with factory lamb seeing prices in general from €105-108/hd. 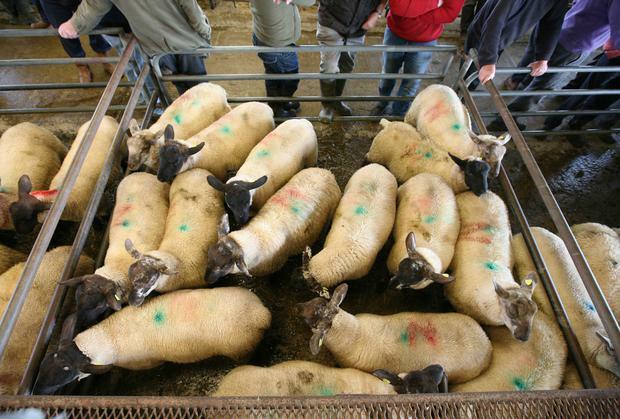 Stores were “lively”, Jim said, with 35kg+ making from €74-90/hd while lighter lambs to go to grass sold from €60-73/hd.